The increasing complexity and expense of the modern light microscope means that they are generally kept and maintained within specialist imaging facilities. This page gives you other websites that I have found useful whilst managing a bioimaging facility. The links are not in priority order, but have been added when I’ve come across them. The RMS/BioImagingUK database is here. These advanced light microscope systems, found in core facilities worldwide, have made it possible to study dynamic processes in living cells, rather than trying to assess structure and function from a series of snapshots of dead or isolated cells. All living systems have an inherent time course, and microscopes make it possible to collect images and data not only in three spatial dimensions (x,y,z), but in time (t) and also spectrally (lambda) with changes in wavelength. As such, the cell itself becomes the ‘test-tube’, and although challenges to image fidelity and maintaining the cellular environment whilst imaging still remain, multi-dimensional live-cell in-vivo imaging offers correlating data to in-vitro and in-silico studies. On the sidebar you will find a review paper about the purpose and function of an advanced light microscopy imaging facility that I have written. You can download a similar article written by George McNamara & Carl Boswell from Lab Manager. 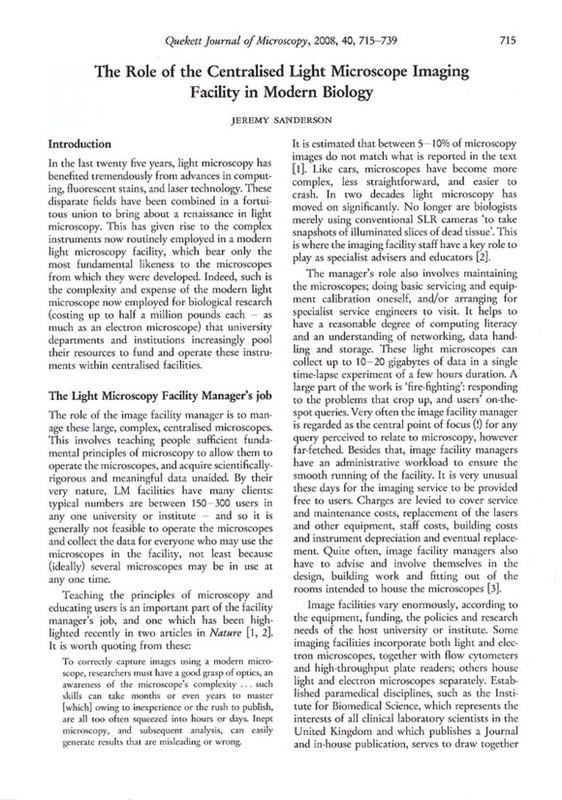 Here, also is a link to a further paper that I’ve written for the amateur society, the Quekett Microscopical Club, on imaging facilities. 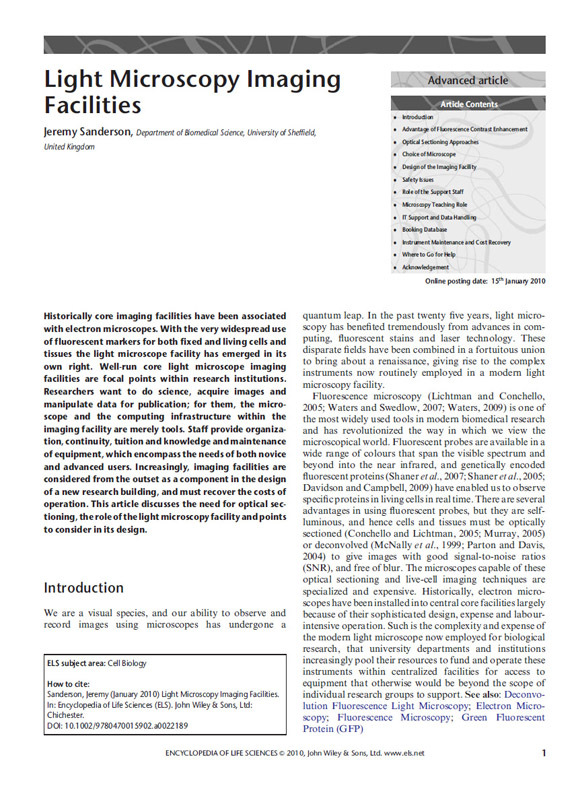 A list of things to consider when designing and building an imaging facility that I have written can be found here, and which was published as an Appendix to George McNamara’s 2016 update to his 2005 article on Microscopy & Image analysis in Current Protocols in Human Genetics. Klaunberg BA, Davis JA. (2008) Considerations for laboratory animal imaging center design and setup. ILAR Journal 49/1: 4-16. Lyttle, T (1999) A model university analysis and instrumentation facility Editorial in Int. Scientific Comms. (no further citation details).